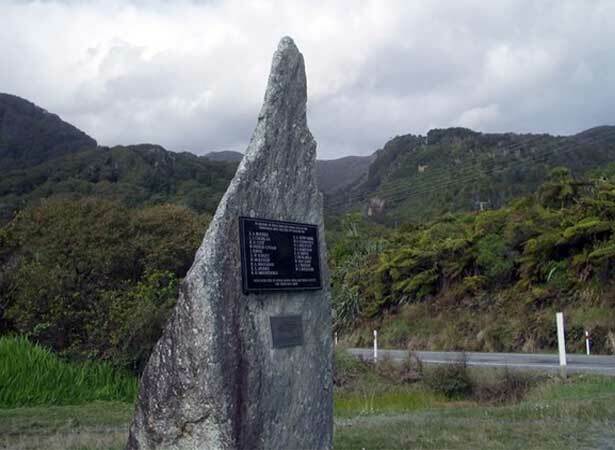 Nineteen men were killed when an explosion ripped through the state-run Strongman coal mine at Rūnanga, on the West Coast of the South Island, just after 10 a.m. An inquiry found that safety regulations had not been followed and a shot hole for a charge had been incorrectly fired. Located just north of Greymouth, the Strongman mine (New Zealand’s largest underground coal mine) had had an impeccable safety record since its opening in 1939. But in January 1967 an explosion sent a fireball through a section of the mine, in which 240 men were working at the time. A higher death toll was avoided only because a wet patch in the tunnel near the site of the explosion slowed down and then extinguished the fireball. Smoke and firedamp (methane gas produced by coal) made the search for survivors and bodies hazardous. When mixed with a certain proportion of air, firedamp becomes highly explosive. Those involved in the rescue were at constant risk of another explosion. After 15 bodies were recovered on the day of the explosion, it took another three weeks to retrieve two more. The last two men could not be recovered and the tunnel was sealed off. Five men involved in the rescue received the British Empire Medal for their bravery. An inquiry into the disaster concluded that at least two mining regulations had been broken. The government was ordered to pay compensation to the families of the victims. New Zealand’s worst mining disaster remains the explosion at Brunnerton in the nearby Grey Valley in 1896, in which 65 men were killed. We have 9 articles, related to 19 killed in Strongman Mine explosion at Rūnanga.